Spontaneity would have to do with the physical mudra or gesture that encompases Buddhism. That is, the same moment can never happen twice, so be aware of it as it passes. 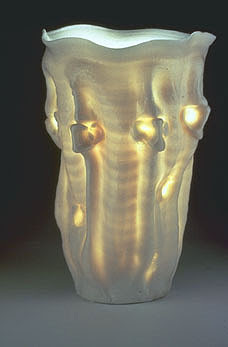 In order to improve the translucency and strength of porcelain, Staffel revolutionized the “recipe” for porcelaneous clay bodies, which enabled him to create glowing, calligraphic vessels. Translucency absorbs light, holds light, and lets some go through… it stores light, while it transmits light… inner light. To be aware of translucency, you must have opaqueness… You are not aware of push until you see pull. It’s the contrast in the body of the pot, between thick and thin, that gives the sensation of translucency. I think about Rudi’s work frequently, grateful that I was able for 4 years to watch these beautiful forms develop. His Light Gatherers can be seen at The Philadelphia Museum of Art, and the Smithsonian Museum of American Art. This entry was posted on Wednesday, January 30th, 2019 at 19:15	and is filed under For Peace. You can follow any responses to this entry through the RSS 2.0 feed.